September 1 opens the door to another year of Black giving in all its forms. Let’s keep giving augustly, and celebrate together again next August! In substance and in symbolism, The Soul of Philanthropy Reframed and Exhibited represents our giving circle’s gifts of time, talent and treasure. 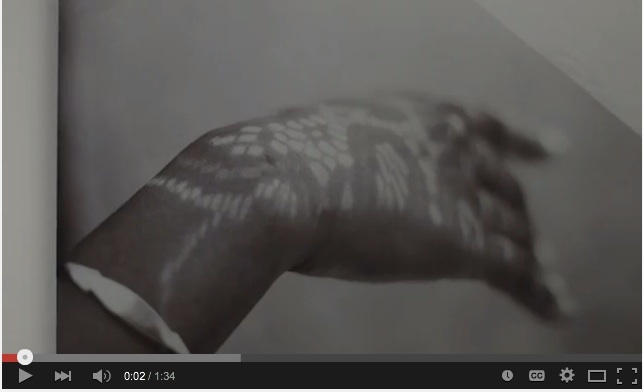 It is part of our civic leadership in reframing portraits of philanthropy. Through the power of art and culture, the exhibit is designed as a call to action toward a movement of conscious giving for social change. On September 5, the Pop-Up, Abridged Edition of “The Soul of Philanthropy” exhibit opens to the public at Charlotte’s Levine Museum of the New South. It will run through February 2016—Black History Month. Visit and you will see the exhibition celebrates our stories, which span the Old South and the New South. Our circle’s work is also shaping The South of the Future, because we recognize that Black giving matters. 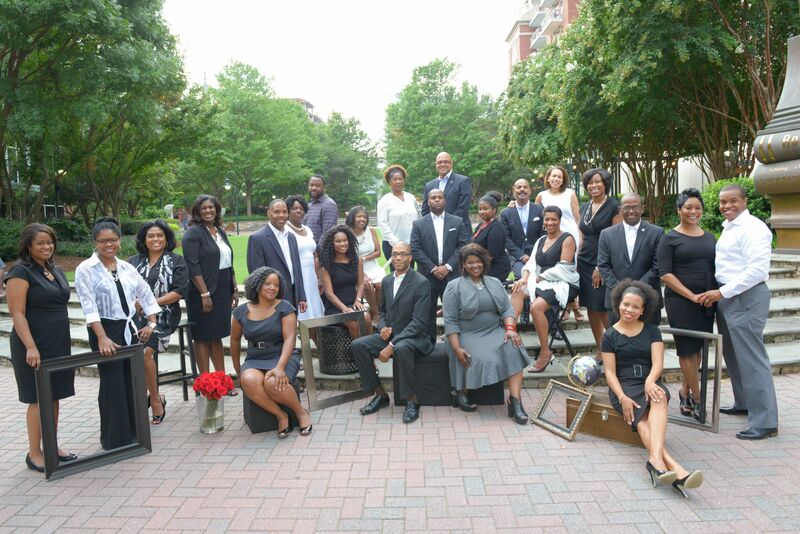 Group portrait featured above was taken at The Green, Charlotte, North Carolina, August 16, 2015. Members and the year they joined the giving circle are listed below and ordered as pictured from left to right. Get in the picture! Contribute to or join our circle at New-Philanthropists.org. While it’s disputed who first said it, that quote IS true. Today we packed up at Johnson C. Smith University‬ for Denver—the next stop of The Soul of Philanthropy Reframed and Exhibited. In August, the exhibition will be on display at Blair-Caldwell African American Research Library, with community partners that include: The Denver Foundation, The Denver CO Chapter, The Links, Incorporated, DAAP – Denver African American Philanthropists and Spin Denver. The community’s interest and show of support at Friday’s closing reception for ‪The Soul of Philanthropy‬ exhibition at the Johnson C. Smith University ‪library was deeply moving. Some folks who attended the opening event in February returned to see it again. A few of them brought along a friend or family member this time. The experience was affirming in many ways, particularly in the context of such hot days and heated times. Outside temperatures soared beyond 90 degrees and inside the library’s air conditioner was out (our Giving Back hand fans were, indeed, handy). And just the day before, news broke about the horrific shooting at Emanuel AME Church in Charleston, where JCSU administrator Malcolm Graham lost his sister in the massacre. 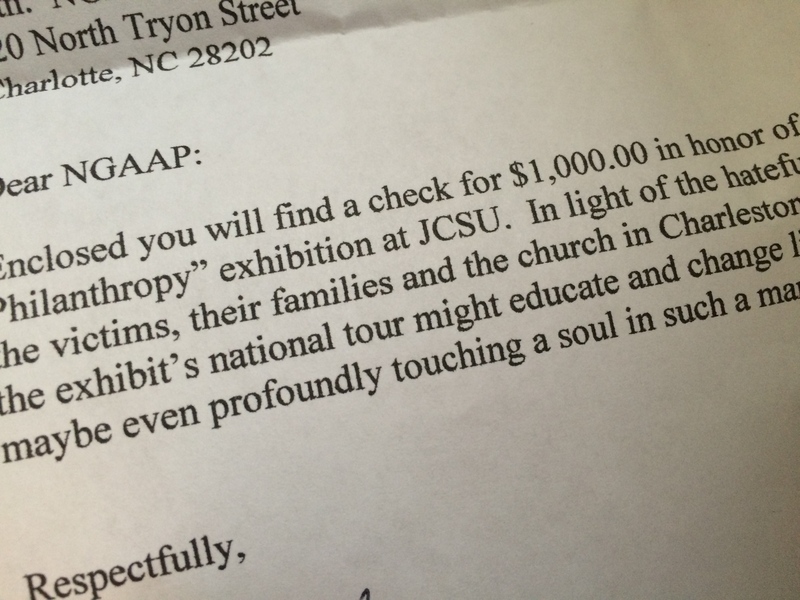 Enclosed you will find a check for $1,000.00 in honor of [name of NGAAP member] and “The Soul of Philanthropy” exhibition at JCSU. 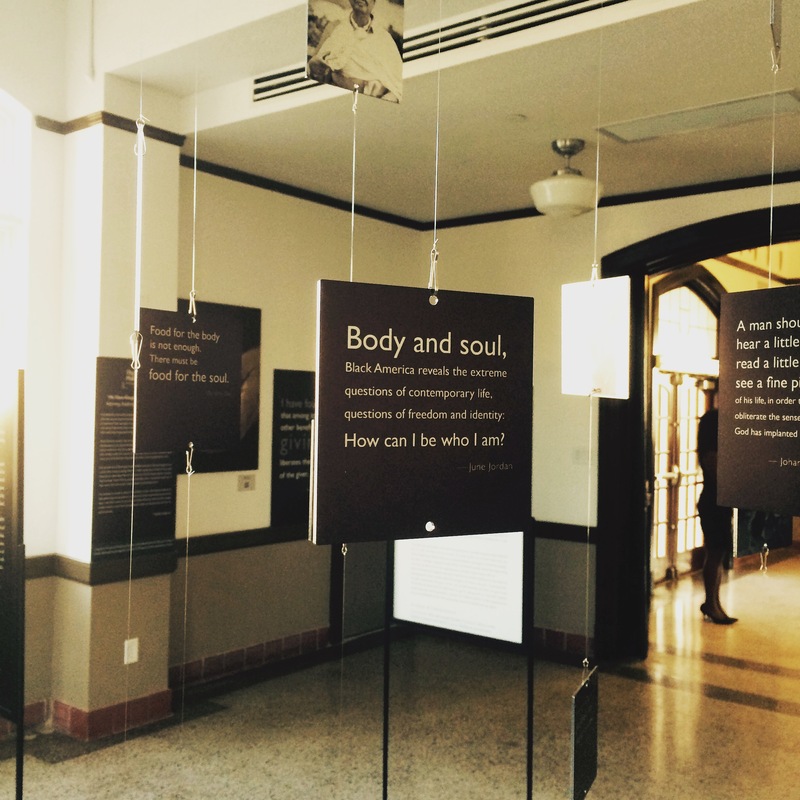 In light of the hateful, racist and tragic events visited upon the victims, their families and the church in Charleston, SC this week, it is my earnest hope that the exhibit’s national tour might educate and change lives in unknown and unknowable ways, maybe even profoundly touching a soul in such a manner that turns hate to love. 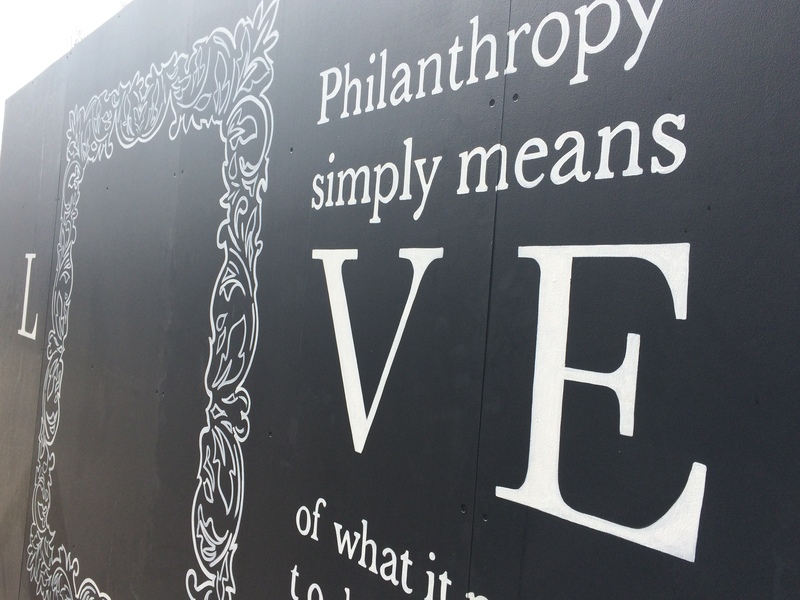 A dream for years, the outdoor, interactive walls of The Soul of Philanthropy exhibit were installed on February 18 (two days before the exhibition’s opening) outside the venerable façade of Biddle Hall—the heart of Johnson C. Smith University. In pure ecstasy, at the sight of a dream come true, I, along with a flurry of snowflakes, danced about and melted at the site. My long labor of love, about the love of humanity, had manifested a momentary monument to love itself. 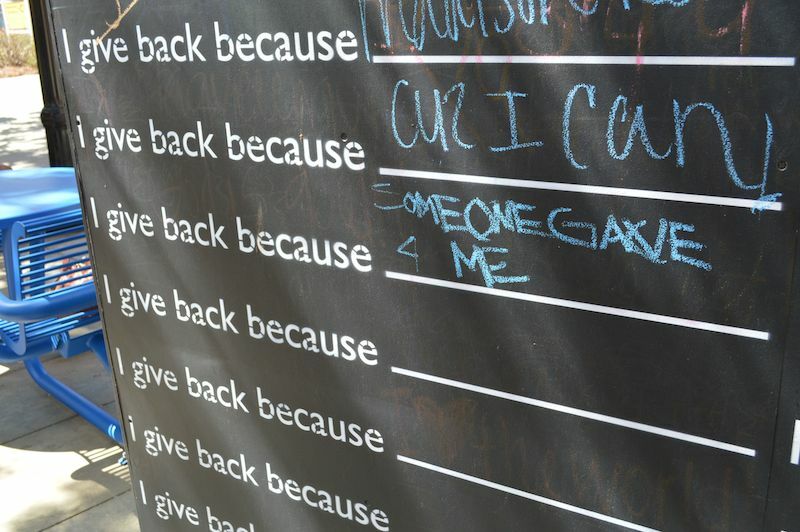 For 98 days, my giant love magnet drew to its walls crews of JCSU students, curious campus guests and social media-savvy visitors to the exhibition in the library’s gallery. 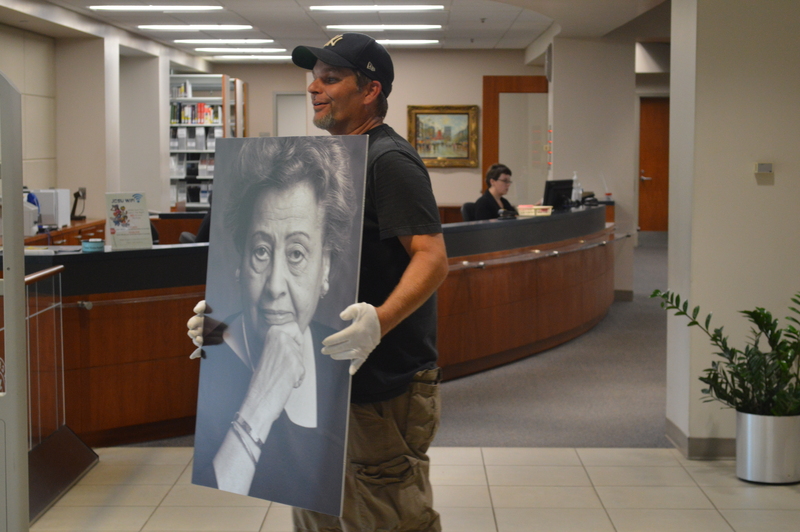 Every day a fresh canvas, the walls invited, captured, presented, broadcast and reframed portraits of philanthropy. Yesterday—after our grand opening event, the snow left, springtime arrived, founders week passed, commencement ended and nearly a semester on campus—the “love walls” came down. You’re sure to see the structure (and bits of colored chalk) pop up some place new soon. In the meantime, below is a photo slideshow from the 98-day reign of LOVE at Smith.